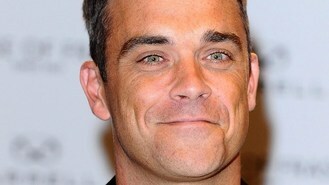 Robbie Williams has been showing off his new muscles. The Take That star posted a picture on Twitter of his bare, tattooed chest, while flexing his muscles. Robbie, who missed Take That's appearance at the Olympic Closing Ceremony because wife Ayda is expecting their first child, looked as though he had been spending a lot of time at the gym. In March, the singer posted a picture of himself online to deny that he'd got fat. Robbie had been photographed leaving a Greek restaurant in Malibu with a reported "double-chin" and responded with the snap and the words: "Thank you for your internationally syndicated horrid picture of me (the one you put up of me leaving Taverna Tony's...). "Just to 'weigh' it up here's me at home the next day." Noel Gallagher has mocked his brother's appearance at the Olympics closing ceremony and claimed he turned down an invite to perform there because he was asked to mime. Gary Barlow looks set to stay in the UK for the judges' houses segment of this year's X Factor as he continues to come to terms with the loss of his unborn child. Rizzle Kicks have revealed they would love to collaborate with Plan B.
Amelia Lily has said she never had the hots for One Direction's Niall Horan. Noel Gallagher has mocked brother Liam's appearance at the London 2012 Closing Ceremony, according to reports. Stars including Geri Halliwell will tread the boards in the West End to raise money for Children In Need. Lady Gaga has admitted that she has fallen foul of the "monsters of fame".